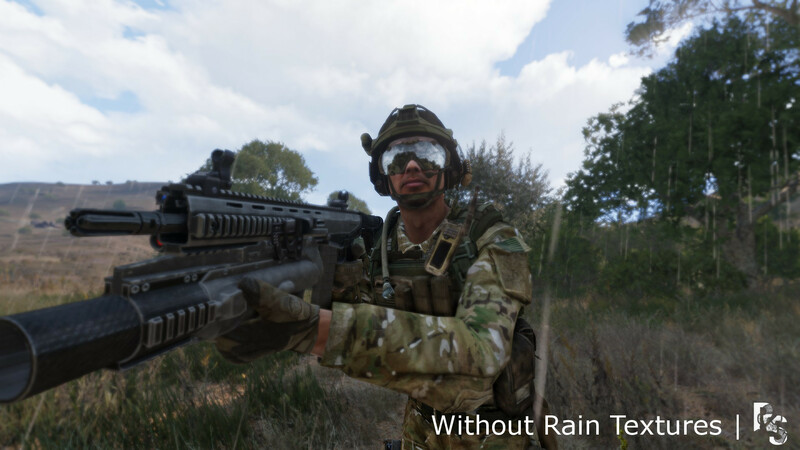 These are textures for your gear and weapons, that will turn on while it is raining, which should add to the immersion and experience of fighting while it is raining in Arma 3. The changes are subtle and it shouldn't distract you in combat, but they are exaggerated under direct light, which makes it fantastic to look at at night with street lights hitting the water drops. When the "rain value" in game is above 50%, doesn't matter whether it is in the Editor, or the Singleplayer Campaign, the textures will apply to the gear. 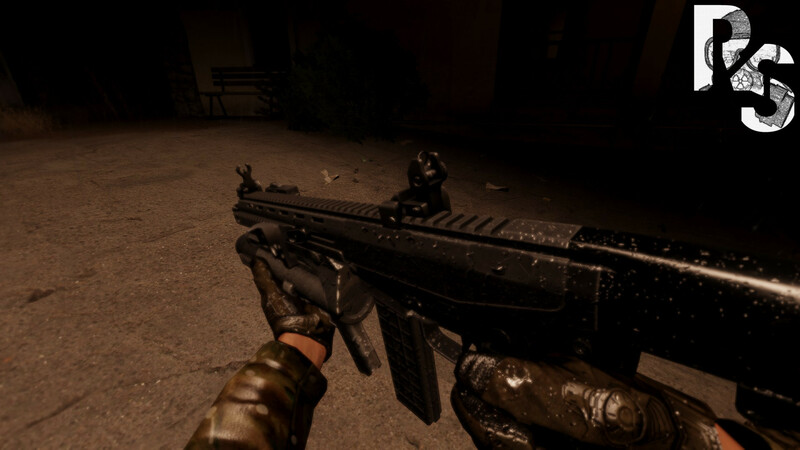 If at any point the rain calms down, or stops, the textures will be removed from the weapon. 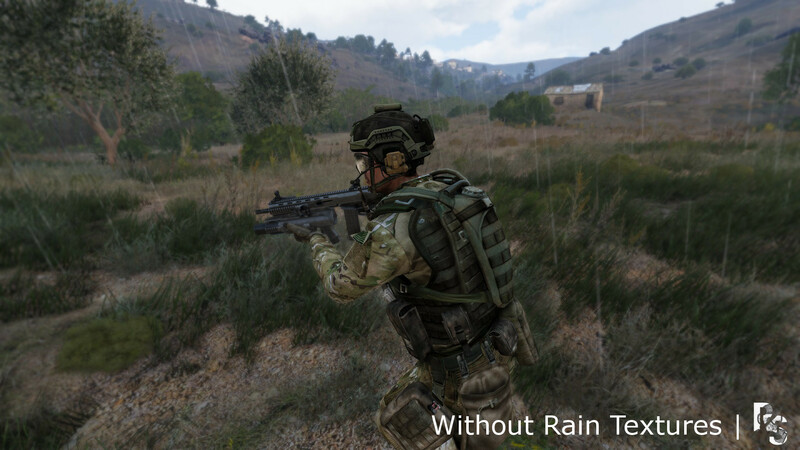 This was designed with seamless integration in mind, it should be fully compatible with any missions or campaigns that contain Vanilla Arma 3 Content. All Experimental functionality can be turned off as a fail safe. This is because, as per usual, RVMATs are very temperamental and often choose not to load for no particular reason. It's because of this that I've written in overrides to stop these experimental features from running if you deem them to be more detrimental to your experience than beneficial. 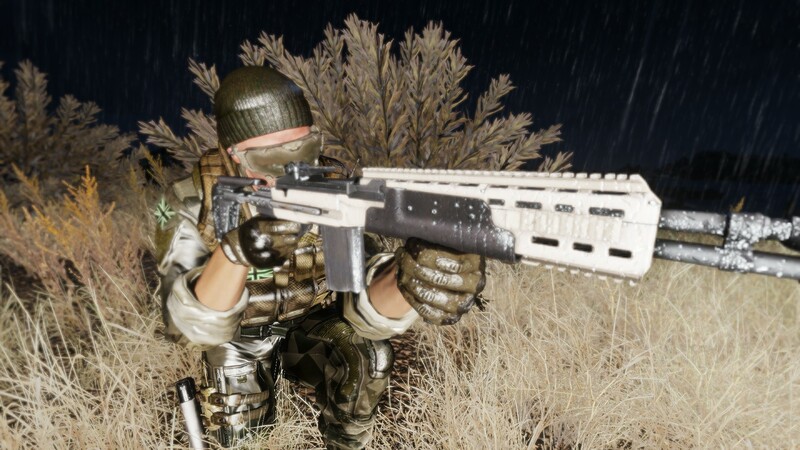 In addition to this, the default rain rvmats are not likely to look as good as custom made ones might, so they will act as placeholders (specifically the uniforms and backpacks) until I can find time to finish them (this only applies to vanilla gear). I would've used this system for all gear items but unfortunately setObjectMaterial can only operate on Uniforms and Backpacks... such is the way of things. All vehicles will now have a default rain material applied. Over time all textures will be improved and upgraded along with the release of each new set of re-textures. All of the current features will be tweaked and altered dependent on user feedback, for the best all round experience of this modification. I haven't done extensive testing with regards to FPS yet, you will probably receive a minor FPS dip while the changeover of textures occurs, but after it finishes everything should return to normal... this will depend directly on how many units are in the mission you are playing, because it will have to change over the textures for each of them. Depending on feedback I may change how the script works for better performance, but at the moment you shouldn't notice any problems with your FPS. If you do, alert me right away please. 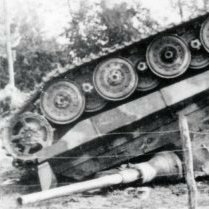 You can do this is the Bug Reports Discussion. Thanks! Have any Bugs to Report? 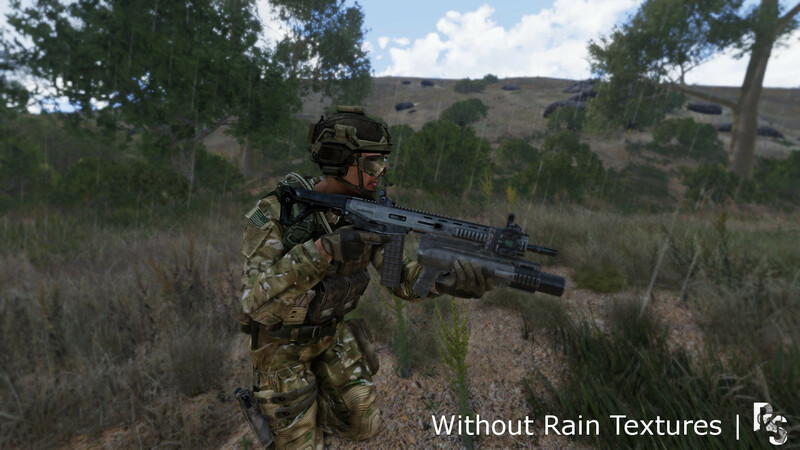 Added: Experimental RVMAT for all uniforms to apply rain textures (including modded uniforms). Note that this only applies if a rain class is not already defined for the uniform. Added: Experimental RVMAT for all backpacks to apply rain textures (including modded backpacks). Note that this only applies if a rain class is not already defined for the backpack. 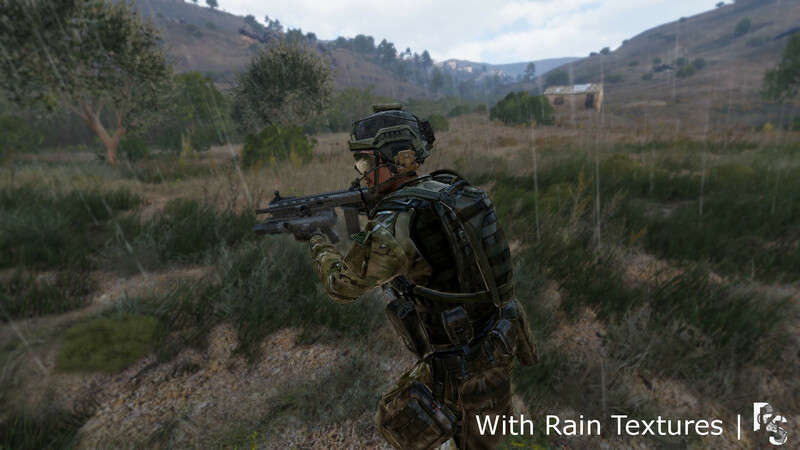 Changed: Refactored the Gear Switching Component of Rain Textures, now supports all weapon attachments, items and magazines (provided they have defined rain classes). 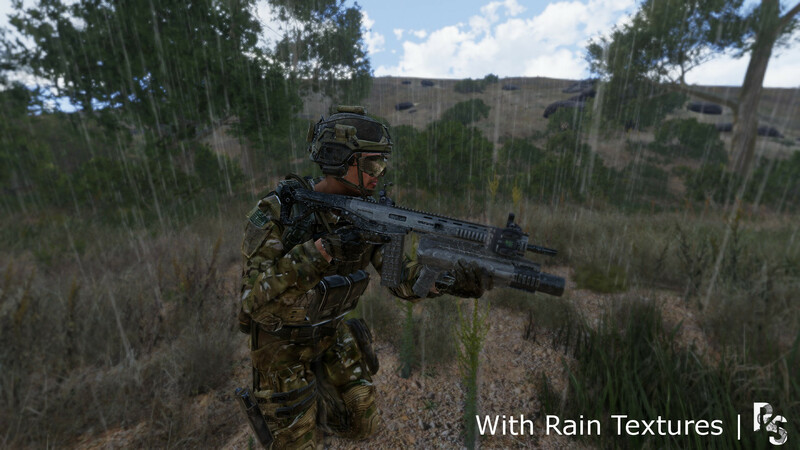 Added: New Rain Textured Weapons ... Katiba Rifle*, Rook 40 Pistol*, ACPC2 Pistol*, 45 Pistol*, Zafir LMG, Rahim Marksman Rifle, GM6 Sniper Rifle, RPG32 Rocket Launcher. Potentially Fixed: Script Error that Causes Gear to Duplicate in Certain Circumstances on a Dedicated Server (Testing Still Underway). Added: Script Handles for modifying dry-off time based on time of day, weather etc. (During the Day when it is sunny gear dries much faster than early morning and cloudy). Added: Script Handles for dynamically altering textures (should prevent having some gear inversely swapping to and from rain gear when it was meant to be dry or wet). Fixed: Error caused by incorrect Bikey/Bisign. Fixed: Error in Script Handles for drying off when inside a vehicle or building, this should work as intended now. v0.3.1 Please Note: This is a small script based update, no new Rain Textured content is present. Added: Textures for a Large Number of Caps, Hats, and Beanies. Added: Textures for Crew Helmets for NATO and CSAT. 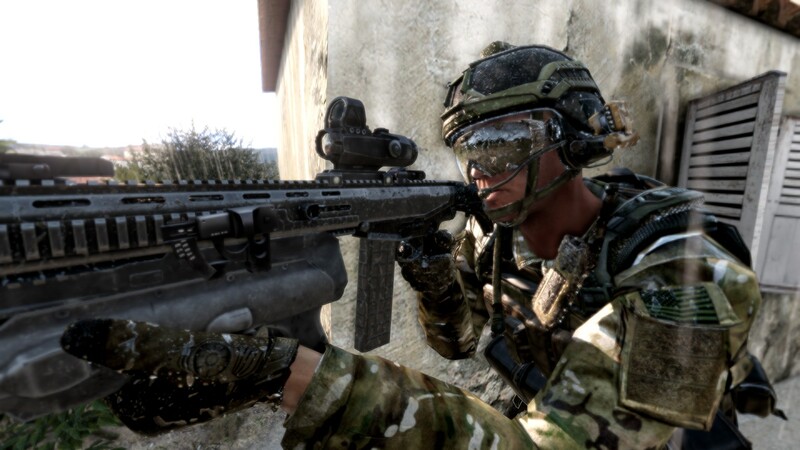 Added: Textures for Heli-Pilot/Crew Helmets and Uniforms for CSAT, AAF, and NATO. 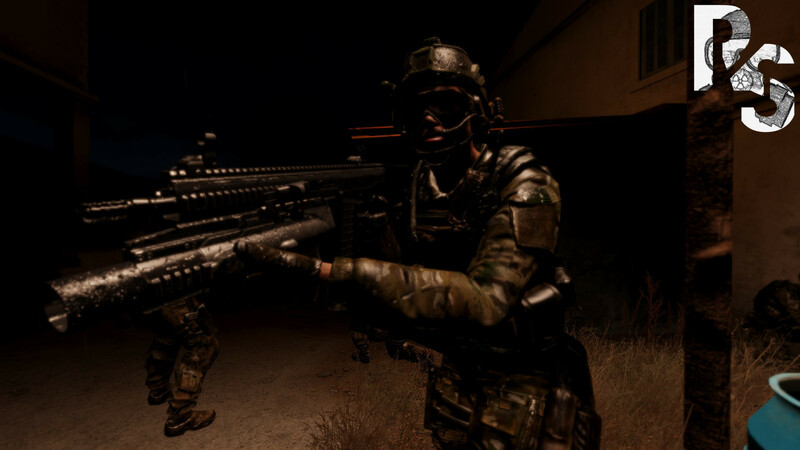 Added: 2 Weapons - Mk.14 EBR, and M320 NATO Sniper Rifle. 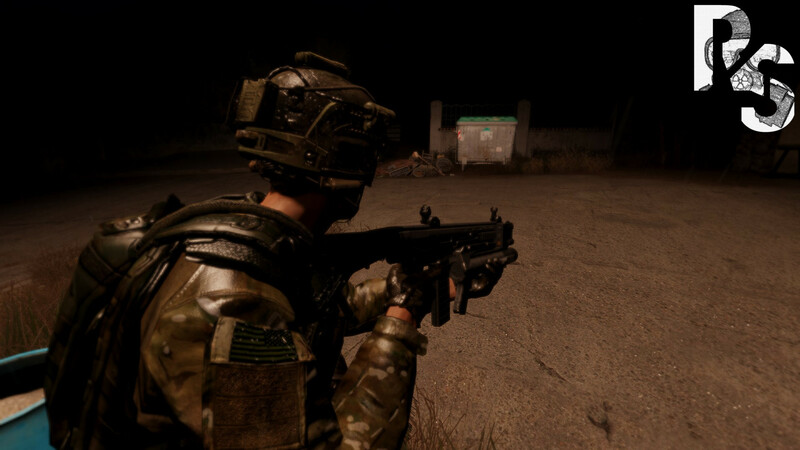 v0.3 Please Note: Launchers, Night Vision Goggles and Ghillie Suits are not present in this update as they are a WIP at the moment. Fixed: Error when a Unit is deleted that has Rain Textures Running. Fixed: Gear should be returned to the correct place now (i.e. If it was in your vest it should be put back in your vest). Fixed: When playing in MP Functions should only be run once per unit now. Compatibility: Minor Changes to the Way the Functions work, should fix "Enhanced Movement Modification" Compatibility Error. Added: Goggles Rain Textures (For Some Glasses and Goggles). Changed: Reworked the Normal, Colour, and Specular Maps for the Grenadier Plate Carrier. Fixed: Compatibility with ACE and CBA now working. Changed: Textures for all the Backpacks, Vests and Uniforms (Should make the fabric looks less "Hydrophobic"). Tweaked: Specular Maps for the Helmets. Unfortunately I discovered, quite recently while putting together this update, that a couple of the weapons (and every attachment available for the weapons), did not have hidden selections. What this means is that I am currently unable to display the custom Rain Textures in game for these affected weapons and items. I've posted on an existing Feature Request Similar to what I need, and Hopefully we'll be able to get those added at some point. The textures are in place and ready to go, so as soon as the selections are added, they will reflect in-game. Rain Textures Uses Classnames to figure out whether or not it is a rain texture, then switches them to or from Rain Textures depending on the initial logic test. It follows a very simple convention, and that is: If the classname ends in "_Rain" then it is considered to be a rain class. This means that it is incredibly simple for you as a mod maker to add Rain Texture Classes to your mod, without making them dependent on the Rain Textures Mod. Currently I only have textures available for some of the Vanilla A3 Content, which means that if your content is re-textured A3 Assets, this will work for you. However if you are using custom models adding compatibility will require custom .rvmats (see "Creating new Textures" for more details). Plate Carrier GL - "\rt_blufor\Data\vest_gl_rig_rain.rvmat"
The adjusted .rvmats should make all the necessary materials more Shiny and Wet looking, but I would recommend that you also create a version of your clothing items that are darker with a higher contrast (Just looks more Natural In My Opinion). 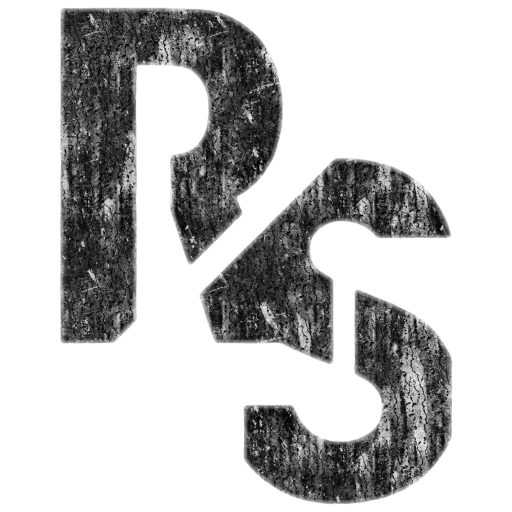 This Content is Licensed under the Arma Public License Share Alike (APL-SA). As always, please ask permission from me directly before reproducing and or modifying the content within this mod. Very impressive. Wet textures are really something that shouldve been included in the base game. Looks amazing, I feel like this was something that the game was sorely missing. Hope that other add-on makers use this for their content as well. Great work! too bad this can't be done via shaders to be applied to everything. 10/10 for "wet" look of gear and uniform. I would recommend adding some delay between "wet" and "dry" states of the effect to simulate a time of "drying" of the equipment. This could also be expanded as dust, dirt and mud textures in desert etc.. environments. Is there no way that a generic texture can be applied to objects by a script? At least as a stopgap until hand-made textures are created. That's a really nice looking effect. Great job. Cool indeed but for some reason Enhanced Movement mod disappears when i run with this one. I am working on this right now as placeholders for stuff that doesn't have textures made for it specifically. Can confirm that I just squashed this bug in my private build. I am hoping to get the update out later today. Big thanks to everyone for the Positive reception! This is absolutely fantastic, I've wanted to see something like this since about 30 seconds after the first rainstorm inArma2. If you could do something similar for road surfaces you'd have people queueing up to shake your hand! Same as Bad Benson, I really wish we had a proper shader tech for this stuff! When I saw this I honestly went WOW. 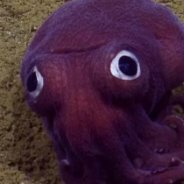 Would be awesome if you guys outreach this to the RHS mod. Just simply a Amazing Mod so far.. :wub: BI, check this out... splashes on the surface? is possible? This is why we should have a much more exposed shader system. So many possibilities. BI should develop a universal shader system like this. Rain mapping is a must! is rain mapping the effect that is shown on the train that is sticking out the tunnel? like only making surfaces look wet that are exposed to the sky?